"I will go into deepest sorrow that I may find my God," writes Gertrude von le Fort (meditation two). Indeed, men and women of faith from all generations, bear witness to encountering God in deepest sorrow. The church teaches her people year after year to find the holy in the observances of Passiontide. Go to your deepest sorrow. And there, find the One hidden but for the open wound of grief. Thus, having embraced God in our sorrow, we're equipped to extend our own loving arms into a sorrowful world, "for sorrow is great in the world, mighty and without end." May the blessings of this season fill you with wonder. What language shall I borrow to thank thee, dearest friend, for this thy dying sorrow, thy pity without end? Oh, make me thine forever! And should I fainting be, Lord, let me never, never, outlive my love for thee. A dread and marvelous mystery we see come to pass this day. He whom none may touch is seized; he who looses Adam from the curse is bound. He who tries our hearts and inner thoughts is unjustly brought to trial. He who closed the abyss is shut in prison. He before whom the powers of heaven stand with trembling, stands before Pilate; the Creator is struck by the hand of a creature. 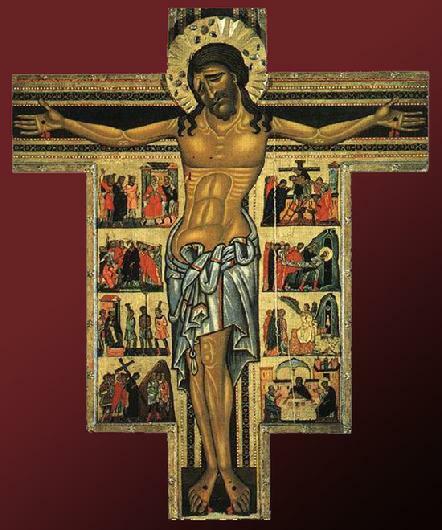 He who comes to judge the living and the dead is condemned to the cross; the Destroyer of hell is enclosed in a tomb. To bear them out, and with my state agree. Which want provision in the midst of all. For mine excludes both measure, tune, and time. and tread on a land without borders. are shattered, it has endured the weight of infinite love. Thou God under my death. Christ was in the tomb; the whole world was sown with the seed of Christ’s life; that which happened thirty years ago in the womb of the Virgin Mother was happening now, but now it was happening yet more secretly, yet more mysteriously, in the womb of the whole world. Christ had already told those who flocked to hear Him preach that the seed must fall into the earth, or else remain by itself alone. Now the seed of His life was hidden in darkness in order that His life should quicken in countless hearts, over and over again for all time. His burial, which seemed to be the end, was the beginning. It was the beginning of Christ-life in multitudes of souls. It was the beginning, too, of the renewal of Christ’s life in countless souls. Glory be to You, who laid your Cross as a bridge over death, that souls might pass over it from the dwelling of the dead to the dwelling of life! I don't know who - or what - put the question, I don't know when it was put. I don't even remember answering. But at some moment I did answer Yes to Someone - or Something - and from that hour I was certain that existence is meaningful and that, therefore, my life, in self-surrender, had a goal. From that moment I have known what it means "not to look back," and "to take no thought for the morrow." Led by the Ariadne's thread of my answer through the labyrinth of life, I came to a time and place where I realized that the Way leads to a triumph which is a catastrophe, and to a catastrophe which is a triumph, that the price for committing one's life would be reproach, and that the only elevation possible to man lies in the depths of humilation. After that, the word “courage” lost its meaning, since nothing could be taken from me. As I continued along the Way, I learned, step by step, word by word, that behind every saying in the gospels, stands one man and one man's experience. Also behind the prayer that the cup might pass from him and his promise to drink it. Also behind each of the words from the cross.